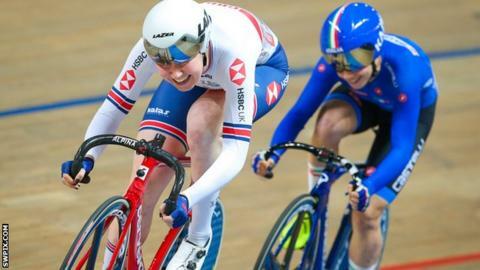 Olympic champion Katie Archibald crashed on a disappointing day for Britain at the Track Cycling World Championships in Poland. Archibald was able to continue but could only finish seventh in the omnium in Pruszkow, while her brother John Archibald was seventh in the men's individual pursuit. Britain's Mark Stewart was eighth in the men's point race with Mark Downey winning bronze for Ireland. Joe Truman was 11th in the men's kilo. Despite not adding to silver medals in the men's and women's team pursuits and Elinor Barker's opening day gold, Britain remain third in the medal table. Archibald endured a frustrating time in the multi-event omnium after replacing four-time Olympic gold medallist Laura Kenny on the start list. Kenny was scheduled to ride in the event, in which she won gold at the 2012 and 2016 Olympics, but pulled out due to illness. Starting the final points race in eighth, 28 points off a medal, Archibald featured in several of the early sprints before falling heavily in a crash with America's Jennifer Valente. While rips were visible to her kit, the 24-year-old did manage to resume but was unable to close the gap to the leaders. "I didn't follow through on that plan. I guess what's worse is I don't feel bad, I've just been so consistently ungraceful, I suppose." The Netherlands' Kirsten Wild took gold for the second successive year, with Italy's Letizia Paternoster winning silver and Valente taking the bronze. Neah Evans will now take the place of the injured Archibald in Saturday's Madison, partnering Barker, who won the scratch race on Wednesday. John Archibald, Katie's brother, underwhelmed in the 4km individual pursuit as Italy's Filippo Ganna won gold. The 28-year-old had clocked the second fastest-ever time in the event - at four minutes 9.584 seconds - in Manchester in January. But he watched Ganna eclipse that time in qualifying while struggling home in 4:14.730 to miss out on the medal rides. "It's disappointing, I'm still trying to put my finger on what went wrong," he said. "From start to finish I could feel myself getting weaker. "I always get very nervous before the race and the drama of it does get to me a bit but at the moment I can't explain why. I just cracked." Stewart also failed to make an impact in the men's point race after winning bronze at the same event in Apeldoorn in 2018. The Scot, who has also won Commonwealth Games gold, finished in eighth as Jan-Willem van Schip took gold for the Netherlands. Spain's Sebastian Mora Vedri finished second, while Downey - riding for Ireland - pipped Wojciech Pszczolarski for third in the 40km race. Downey, 22, finished on the same points (67) as Poland's Pszczolarski, but edged ahead of him in the final sprint. In a hectic and tactical affair, Downey picked up a critical third lap late in the race to jump up the classification. "I know what it's like to finish fourth, so third tonight is just a good as a win after so many emotions of being so close," he said. "That means a lot. I was suffering so much, but I thought I can't let that feeling happen again and to be on the other side of the coin is a very nice feeling."